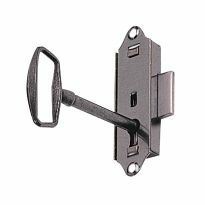 This 1-3/4" long cylinder lock is ideal locking false-front drawers and cabinet doors made of stock up to 1-1/2" thick. The lock has a five disc tumbler and is available in a nickel, antique brass, or brass finish. Available keyed alike or keyed differently. Includes two cams: one for lipped applications and one for flush or overlay applications. 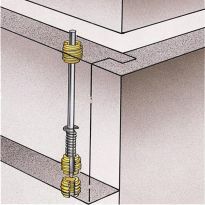 The provided stop washers can be used to set the lock for a 90 or 180 degree cam turn. Easy to install, look great! Easy to use works very nice. Retrofitting an existing desk to locking drawers. This product was easy to plan for the installers and easy for me to procure for the client. The hardest part was drilling the 3/4” hole. It came without instructions, but the diagrams on the web were self-explanatory. Worked well and easy to install. Rockler was the only place I could find a barrel lock deep enough for my project (Jewelry Armoire.) The bonus was that it was available in antique brass! This tumbler cam lock is a step above in quality & features over other cam locks. I love the versatility , and quality of these locks. Gun display of a private library. 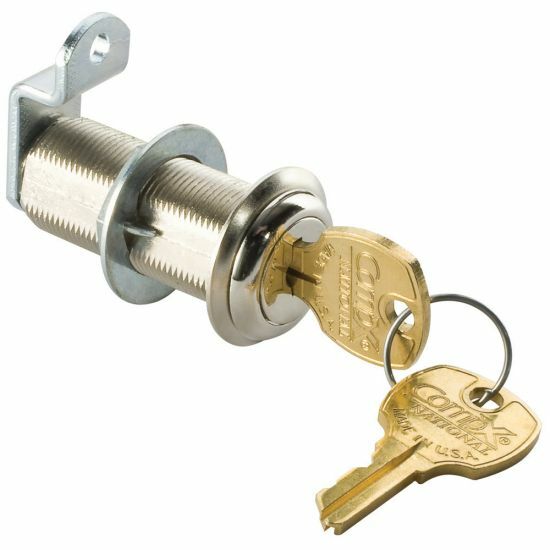 I ordered 2 of these, keyed the same, to lock some cabinets in my RV. They were easy to install, worked great, and look really nice too. 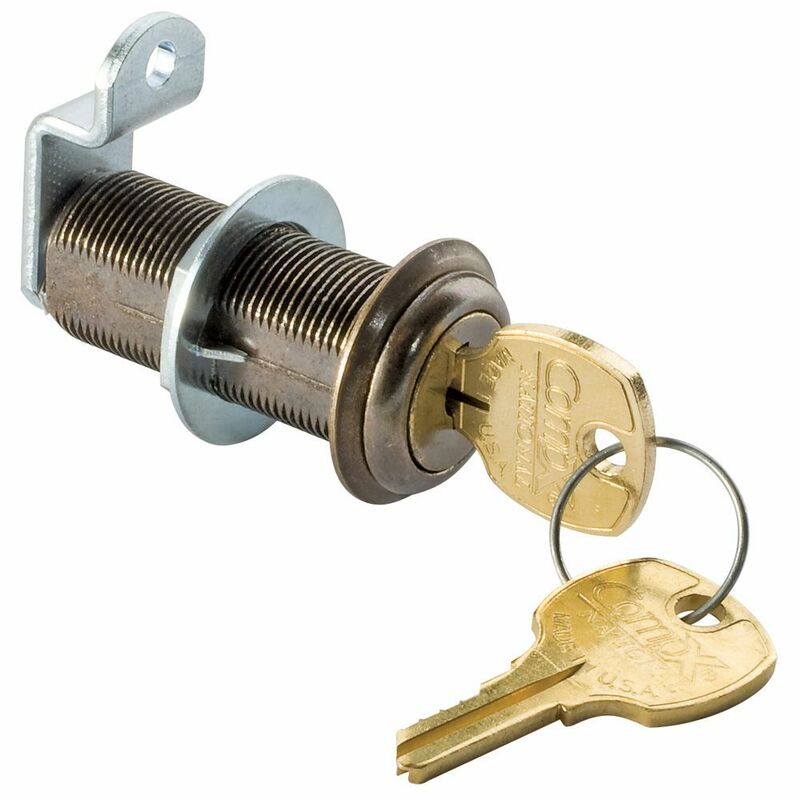 Lock used to secure a cabinet in a recreational vehicle. Fit and finish are very good, and it matches the existing hardware. Prompt curtious serve, locks worked perfectly on kitchen style cabinetry that needed locks at a car dealership. Perfect for drawer's 1/2" thick with 3/4" face. This is exactly what I was looking for...easy to install! 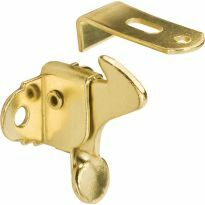 This is a great quality cabinet lock. Obviously an old American design, it has a heavy, solid feel to it, and operates smoothly, not like the typical cheapie no-name furniture locks you find everywhere nowadays. The finish is nice, the keys are numbered. It's threaded all the way down, so you can use it in varying thicknesses of material. 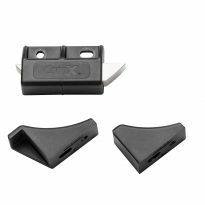 (The same lock is also available in 1-3/16&quot; length. )I didn't think you could still buy this type of quality. Highly recommended for people who appreciate fine details. We first installed a dozen or so of the 1 3/16&quot; cams on cupboards in our vacation home which we rent out. The 1 3/4&quot; was for a bathroom drawer. They all look very finished and not at all ugly (something I was worried about). Took some time to figure out how to install since we were new to it and the tech info on the web was invaluable. It would have helped if the tech data included a drawing with the cam position flipped around for a full overlay door (our application). It took an embarassingly long time to figure that out!! 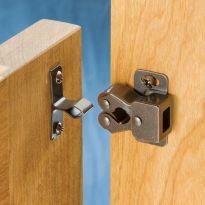 These locks were perfect for our application and the keyed alike a big advantage. I only found one item that could have been improved upon. The keys should have been wire wheel buffed to removed the sharp edges and provide a smooth and easy entry into the cylinder. Once the edges were removed and a little gray graphite applied, the keys operated very nice. Since I had 9 of these to install in a built in dresser, I really liked the ease of installation. These are very good quality locks, and my home owner was very satisfied with them. 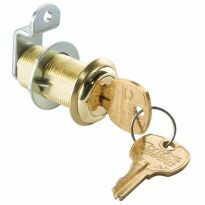 Used these locks to replace child safety locks that always broke after wear and tear - these work perfectly and I like the idea that the little bumpers that will allow you to adjust the lenght of the locks to a minimum. Also like the idea that they come keyed alike as I installed 3 in some cabinets / drawers in an RV to keep children from having access to shape objects and have just ordered 3 more and I only have to use one key. I have not had them that long but they look like they are quality built and will great for the purpose that I have installed them - also easy to install. I installed these on 2 drawers. They came with a surprising number of parts, and the instructions were pretty limited, but it still took just a few minutes to figure out the installation. About 15 minutes to install on the first drawer, and about 5 minutes for the second. Works great. Very good results from 4 cylinders keyed same. Like any locksmithing, installation takes patience and planning. Very complete hardware kit with each lock allows many variations and options. Good value for price. I reordered for two more locks after the first project proved sucessful. I have retrofitted 3 china cabinet doors with ideal locks. I suggest that the large inner-side ring that immobilizes the cylinder have teeth at the outer diameter. Sometimes the hole drilled with a 3/4&quot; spade-bit is larger than 3/4&quot; diameter, and the inner teeth don't meet wood. We had a computer desk hand made for us a few years back. We have two filing drawers in the desk and I have always wanted to be able to lock them. I did some research and found the cam locks through your website. I was able to install both cam locks with ease. They work perfectly. Thanks! This item is light, decently manufactured, easy to install, and reasonably priced. I used this lock for a M-1 rifle display case, and it looks and works well. A special cabinet needed locks to protect the silver contents. I needed a keyed cabinet lock. wanted good quality locks for owners cabinets in the new condo we just purchased. plus being able to have them keyed different along w/keys being labeled was a great selling feature. So all locks could be keyed the same. This what I needed to be able to lock a drawer in a desk. Special order available with the size I needed to complete the project. The cabinet I'm making is for a commercial application and the doors needed to be locked. Finish, apparent quality, and fit. Length of cylinder. Availability of antique brass. Ability to key all locks the same. Ordered 2 of these previously for custom made built ins. worked perfectly, needed to finish out the project. The cabinet door is clad with reclaimed lumber so it's at least 1 1/2" thick overall. I need to secure cutlery in my kitchen drawers from curious children! Length and finish. It's vey difficult to find locks with extra long cylinders. MAKE A PO SPOT IN YOUR ORDER FORM!!!!!!!!!!!!!!!!!!!!!!!! Needed to fit vintage chest, depth not available locally. This appears to be a good quality product and it best suited my needs. My Father orders from Rockler and is always satisfied. Needed this particular length in a cabinet lock. Could not find in local hardware stores. The buyer comments helped me make this selection and spec sheet on the website helped too. Hard to find long cylinder lock of this type! Had difficulty finding this item anywhere else. Matches the design needs for my desk. It provides a convenient installation for a reliable way to lock one of my workstation drawers containing gems and precious metals. I have a lock for a 2 1/2 inch shop locker door that needs replacement and could not find one. We are renting our beach house and would like to lock one bathroom cabinet to keep our personal toiletries handy for us. I chose these to provide locks for a cabinet I built. They worked absolutely wonderful for the job I needed. Had the length needed for my purpose. I need a 2" offset cam. Is one available? can i get 1 3/16 and 1 3/4 cylinders keyed alike? BEST ANSWER: Sorry no, these sizes will not be keyed the same. Can this unit be rekeyed by a locksmith? BEST ANSWER: As far as I can tell, no. With that being said, I believe it would be less expensive and easier to replace the cylinder as opposed to having a locksmith rekey it. Hope that helps. Can you choose to have the key come out on only in the locked position or does the key come out in both the locked and unlocked position? BEST ANSWER: I can't imagine why not, but no, in my experience it comes out in both positions. You don't have to take it out of course. The key comes out in either position. My desk drawer front is a total of 1.5 inches. Will this lock work? BEST ANSWER: Yes this will work for 1.5". There are some spacers that come with it to take up any extra space. Accidently hit the "inaccurate" button. Your response is NOT inaccurate. If the distance from the front of the drawer to the back of whatever part of the desk your securing to is 1.5 inches then yes this should work for you. Mine worked great. I wish I could attach a picture of my application but I couldn't ask for a better, cleaner solution for securing my cabinet doors. Hope this helps. what is the diameter of the cylinder? BEST ANSWER: This cam lock is sized to fit in a 3/4" hole. If it is keyed differantly how can thier only be one? BEST ANSWER: For products that say "keyed differently", each unit we sell has a random key pattern so a key from one lock will not open another lock from that particular SKU. For products that are "keyed alike" all the units we sell have the same key pattern so a key from one lock will open all the other locks. If you are referring to locks for household use, they are usually five to seven pins. The placement and length of the pin determines which key will work. If you have watched when you have sets 'rekeyed, you will see them remove the cylinder, pour out the pins, and, with the new key in the lock, refill with the correct pins for that key. The type of lock shown uses 'baffles', which are pushed up by springs. The right key pushes all 3-4 baffles into position so that the cylinder can be turned in the housing. I have a wood file cabinet - the door stands out from the cabinet. The drawer edge depth is 3/4" and the frame depth is 3/4". I'm guessing I will need 1.5" to secure in place. Would the 1.75" work for this? BEST ANSWER: Yes it will. Your application is the same one I had. It has been quit a while since I installed mine but it should come with two end pieces, what would be the latch. The silver bent piece on the left end in the picture. there should be a straight one as well and a little rubber bumper (included/optional) can be inserted into that hole on top. This piece is held on with a screw so they're interchangeable. The straight latch with the bumper worked for my 3/4" door, 3/4" face frame application. Will this work on a door that is 1" thick? BEST ANSWER: Yes it will. The threaded cylinder is a little over 1-1/2" long. 1" should be no problem. How long are the cams? 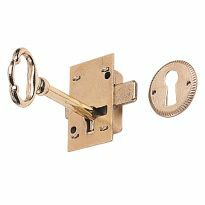 do you have a latch similar to your "1-3/4" Long Cylinder Lock-Choose finish and keying method" that has a knob instead of the key/lock? BEST ANSWER: I got this, but it doesn't seem like you need something so heavy duty and expensive if you don't need a lock. 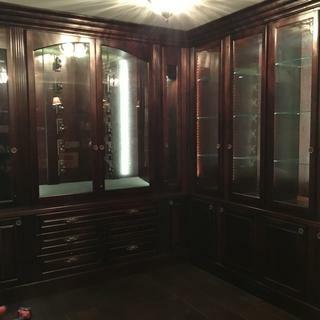 Maybe try a cabinet store for something less expensive. need 2" total length from keyhole to bottom of cam. if offset cam is turned over will total length = approx 2"? BEST ANSWER: I am sorry but I do not understand your question. I suggest you look at the drawing provided on the website. can the cam be removed?